Reserve a few blueberries for decoration and place the remainder in a small pan with the caster sugar and 1 tablespoon of cold water. Heat gently for 4-5 minutes, or until the sugar has dissolved and the juice begins to run from the blueberries. Cook for a further 4-5 minutes, or until the blueberries are soft. Crush with a fork to make a compote and set aside to cool. Whip the crème fraîche and double cream together with an electric or balloon whisk for 2-3 minutes until soft peaks have formed. Stir in the icing sugar and three quarters of the blueberry purée. Lightly fold in the remaining compote to give a rippled effect. 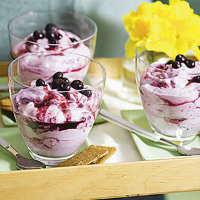 Divide between 4 individual glasses, top with the remaining blueberries and chill until ready to serve. Team with Jules Destrooper Almond Thins.